After about 30 hours of travel, we finally made it to our hotel room in Alor Star, or Alor Setar, depending on which map you look at, biggest city in the northern Malaysian state of Kedah. A driver Mr Mahadi and his young volunteer helper Shah picked us up in the airport, drove us from Penang Island (and state) onto the mainland peninsula and Kedah state. Took us about an hour or so to drive north, including a stop for us for a drink (Kiwi juice!) and a stop at a tyre store when our fancy smart-car told us one of our tyres were low and needed to be checked out. Cheesy American 80's love ballads were on the radio in the background. It's the dry season, but man oh man, what a hot humid place. Steph said "Yeah!" when we stepped outside the airport. I groaned and wilted into the cement. It's green and THICK: miles and miles of palm tree forest/jungle/plantations, as far as the eye can see in the misty/smoggy/steam. Actually I think most of that is from the rice fields being burned off between their 2 plantings a year. There's colorful flowers and trees blooming everywhere along the sides of the highway. Steph and I have 4 or 5 days before any of this endurance ride commotion begins next week, so she was thinking we'd have a few days to be tourists. We do have to buy dresses for the Sunday closing ceremonies/birthday party for the Sultan of Kedah, which will be attended by the King of Malaysia (Steph's friend, and he will probably be riding in the 80 or 120 km ride), and there are rumors that Prince Rashid of Qatar and Prince Abdullah of Saudi Arabia may be there also. Oooh! The Raven's going to love meeting royalty. She also asked about us visiting Langkawi, an island north of here that is one of Steph's favorite places in the world, where she wants to come back to in another life as a red eagle. Our driver said, "No problem! Whatever you want, you tell me!" 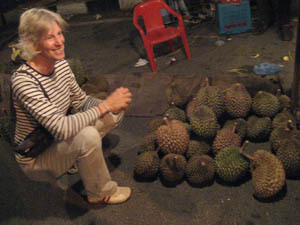 Then she asks if Malaysia has durian. 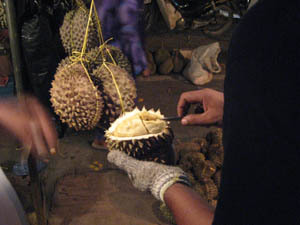 Durian is a fruit distinctive for its large size and shape - it comes in a thick thorn-covered husk, and is known for its 'unique' odor. Some people think it's fragrant (as well as the taste) and some think it's unpleasant or horrific. He says, "Oh, you want to try this?" Steph says "Sure, why not?" She also asked about open-air markets, and he says, "Yes, there's one tonight." Only tonight, it appeared, and since Steph hadn't been to one before, we figured we should go, even though I was now getting pretty tired. Our driver and Shah said they'd pick us up in an hour, 8 PM, at the hotel, to go to the market, which gave me time for a quick shower and fresh clothes, which fooled me into temporarily thinking I was good for another couple of hours awake. Our friends met us in the lobby, then we stepped outside to wait for the car... and I got body slammed by the muggy heat. Ugh! 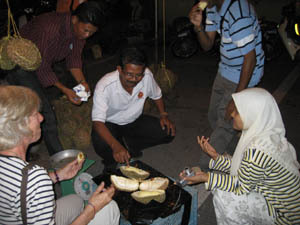 Our driver was standing around, and we wondered what we were waiting for; Shah said we were waiting for a photojournalist who was going to come with us and record Steph trying a durian. 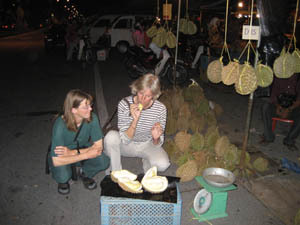 We thought he was joking, but he was not; our mission had changed from what we thought was visiting a local market to the mission of finding durian for Steph to try! A young lady Fattima showed up and jumped in the car with us, and we headed off to a market, Fattima interviewing Steph and taking notes on her answers. 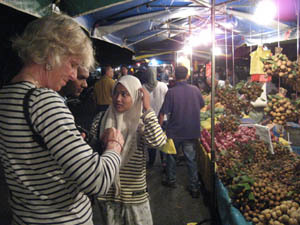 Our Malaysian friends all said they liked durian; Fattima said she loved it. "You are going to try it?" she asked Steph. Steph said yes, and Fattima said, "Ah, yes, the King of Fruit!" We wove through the busy streets of Alor Star (they actually drive in lanes here!) and came to this crazy bustling night market. People strolling, riding and revving their mini-bikes up and down the lane, fruit stands, stalls selling anything you could imagine. Several vendors gave Steph and me tastes of fruits we didn't know; all were very tasty. 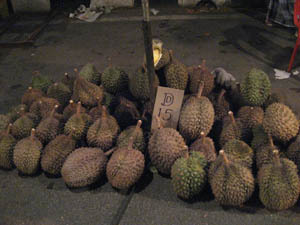 But, there were no durian here. A vendor told our driver we had to go to another market. He told us we could stay here, or we could drive to the other one; Steph and I didn't really care, but you could tell our driver really really wanted to see Steph try a durian. So we said Sure, take us to the other market. We hopped in the car and drove a few miles away to another market - just as busy, bustling, full of people. We pulled up right in front of a stand that had piles of big wicked-looking spiky coconut-like things - they looked like one of those weapons from Lord of the Rings that the Black Lord of the Ringwraiths tried to kill Eowyn with. And - they were amazingly heavy. The vendor picked out one for us - test-cutting some and smelling them before picking the right one to cut open. (The most fragrant/pungent?) He laid it out on a crate covered with a plastic bag, and our driver ceremoniously carried it to the front of the stand. Fattima took pictures, and Shah took my camera and sent me over by Steph to try the durian too. I was supposed to be the photographer, but somehow I got roped into this sampling gig too. A few people gathered around, watching two gringos trying this strange fruit. It was a great setting - chaos, people all around, laughing talking yelling, cars and motorbikes zooming by, a generator running, and right then the call to prayer from the nearby mosque went off. That's just one of the coolest sounds there is, especially in an outdoor setting like this. Pew, the durian certainly did stink. I of course let Steph try it first, being the chicken I am, thinking I'd still be able to get out of it, and I waited while she swirled it around in her mouth, watching her expression closely. It seemed touch and go there for the first few seconds... and she finally said "Hmmm, well, it's not so bad." So I took out a piece from the inside - a lumpy soft squishy blob, kind of like a wet lump of cookie dough, and I took a bite. It was kind of touch and go for me too... it starts out in your mouth as a lumpy soft squishy blob of stinky dough where you can't immediately tell if it's good or if it's going to make you barf. By the time you get past that sensation, it's gotten better, and by the time you finish that bite, it's not so bad. The texture never does improve. But by that point you might as well eat a few more pieces. A very strange fruit indeed, though I don't know that I need to try it again. We walked around the busy market, stalls of trinkets, fruit, skinned chickens, cow legs, fresh fried foods, flip-flops (Steph bought a pair). We tried a few things: little donut-like things, chicken kebabs, a cup of what we'd call custard - corn flavored, which was amazingly delicious. Many friendly vendors gave us free samples of their things. I asked to pick up some of the "noodles" on our way out; Fattima led us to an indoor market store to I guess pick up some dried noodles. What I really meant was "Mee goreng", which was a type of pad thai. I also lusted after the samosas, but figured I'll be able to get those somewhere again along the way. 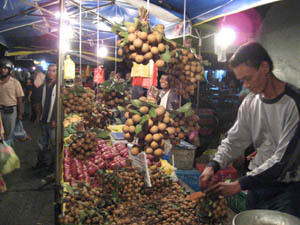 We left the market about 9:30, and got dropped off at our hotel, burping durian fruit, by now both of us pretty wiped out after our long travels topped by our encounter with the King of All Fruits.